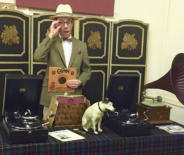 With an impressive collection of 78 rpm records or 'shellacs' and a pair of vintage HMV gramophones The 78 DJ is well placed to entertain guests at weddings, vintage festivals, tea parties and all manner of social events. For larger venues or when playing out of doors his wind- up acoustic machines can be discreetly amplified by modern means. Material ranges from the dancebands of the early 1920's through the early Jazz and Swing eras to the dawn of Rock and Roll and the popular artists of the 1950's. Highlights may include classics such as the “Teddy Bears' Picnic” to Nat “King”Cole's “Unforgettable”. Smartly attired in tweed, pinstripe or even top hat and tails he brings a civilized blend of atmosphere and entertainment to any occasion. 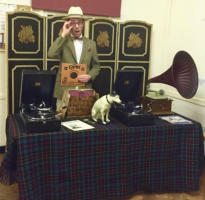 With an impressive collection of 78 rpm records or 'shellacs' and a pair of vintage HMV gramophones The 78 DJ is well placed to entertain guests at weddings, vintage festivals, tea parties and all manner of social events. For larger venues or when playing out of doors his wind-up acoustic machines can be discreetly amplified by modern means. Material ranges from the dancebands of the early 1920's through the early Jazz and Swing eras to the dawn of Rock and Roll and the popular artists of the 1950's. Highlights may include classics such as the “Teddy Bears' Picnic” to Nat “King”Cole's “Unforgettable”. Smartly attired in tweed, pinstripe or even top hat and tails he brings a civilized blend of atmosphere and entertainment to any occasion.